One might say Max Busser of MB&F has become obsessed with the seas. A lover of all things space age, Busser is the genius behind some of the most incredible watches we have seen on the market to date — including pieces with aliens inside and spaceship-like designs. Now, however, MB&F has reached deeper depths. You may recall a few months ago we brought you news of the all-new MB&F HM7 Aquapod watch, lovingly referred to as the Jellyfish, which made its debut at SIHH in January. 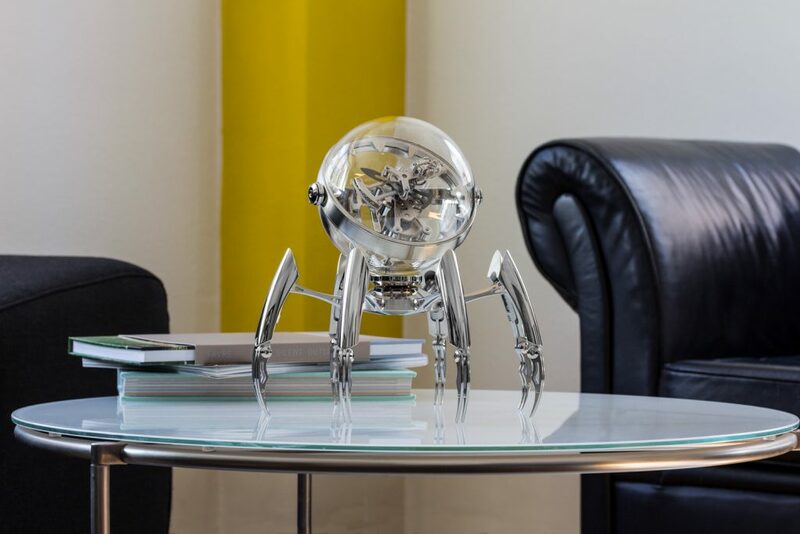 Now MB&F unveils the Octopod luxury desktop clock. Conceived of by MB&F and developed by L’Epee 1839 clockmakers, the MB&F Octopod is a perfect play on the octopus with eight legs and an eight-day clock inspired by marine chronometers. 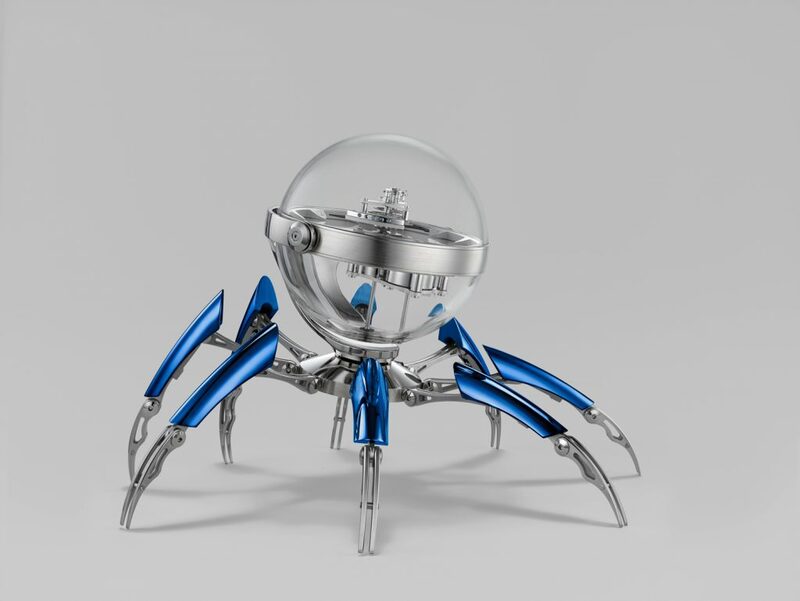 Each MB&F Octopod clock has a kinetic design so that each of the eight legs moves to adjustable heights. Atop of those eight legs, the horological center sphere that is the clock is attached to the octopus body using a gimbal – much the same as those used to affix a marine chronometer into its base for use on ships. That single-axis gimbal enables the head of the octopus to move, so that wherever the clock sits, the head can be rotated into proper position to display the time. 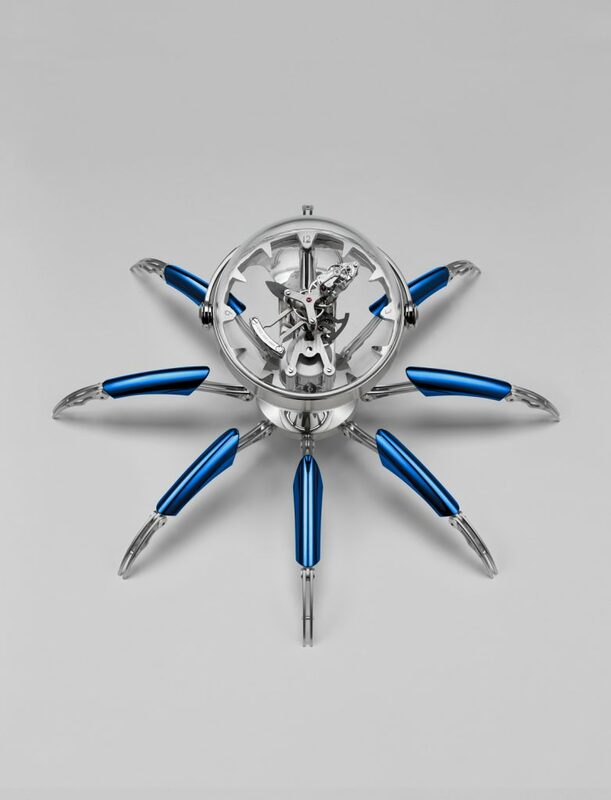 MB&F Octopod clock in blue PVD with eight legs– each one consisting of 31 parts. That entire head sphere is created using sapphire crystal and is totally transparent. Within it, one can view the all-new eight-day movement of the clock. On the minute hand, L’Epee 1839 has placed the pulsating escapement so that – in addition to the regulators rotation, it also completely revolves around the dial every 60 minutes. The clockwork’s baseplate is a transparent glass plate treated with anti-reflective coating on both sides to make it look almost invisible – giving the effect of the mechanism as floating in air – or in this case – water. The Octopod is being created in three versions and just 50 pieces of each will be made. One is in palladium, another in black PVD, and the third – my favorite – is in blue PVD. Each retails for just about $36,000. The complex new eight-day clock movement made by L’Epee 1839 for the MB&F Octopod clock is visible in a transparent sphere that acts as the head of the octopus. This project is not the first time that MB&F and L’Epee 1839 have teamed up. The two companies worked together on the Starfleet Machine, the Arachnophobia three robot clocks: Melchior, Sherman and Balthazar. For the Octopod, the biggest challenge L’Epee faced was finding the right supplier for the glass baseplate who could also manage the diamond-drilled holes. The other challenge was in developing the counterweights for the regulator-bearing minute hand. As always, L’Epee 1839 rose to the challenge. 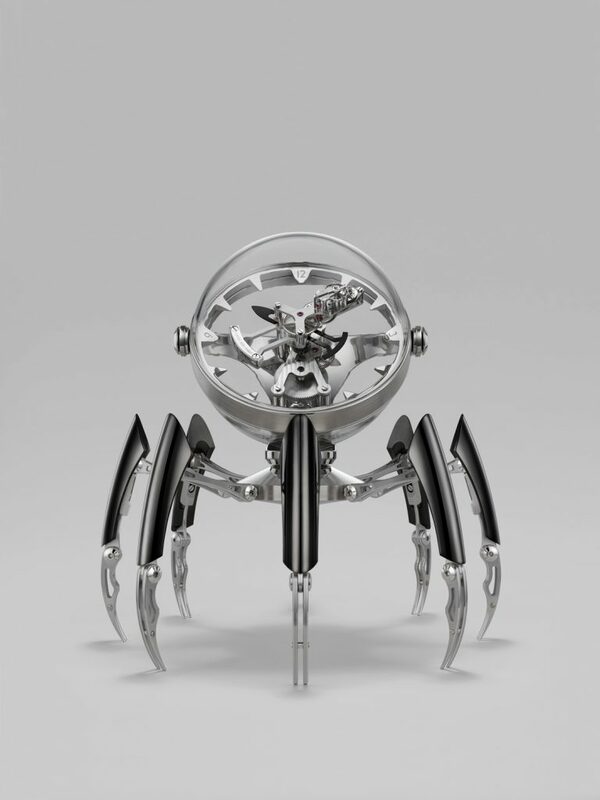 Seen here in the palladium version, the MB&F Octopod clock has legs that are adjustable to different heights. Octopod is available in 3 versions, each in a limited edition of 50 pieces: black PVD, blue PVD, palladium. VIDEO: You can watch a video of the clock and its making HERE.